This fish is not very well known, although its maintenance is easy and its behavior is quite good (although it is quite lively). Discover this nice fish in this page! How to feed the Penguin fish? What kind of behavior does the Penguin fish have? Peaceful but lively. Like all species of the genus, it is gregarious and must imperatively be kept in a shoal. It is possible that a shoal can «merge» with Blue Neons to become one big shoal. Nevertheless, a minimum of 10 individuals of the same species is recommended. Who can live with the Penguin fish? Its roommates will be calm and peaceful. In a South American aquarium, you can associate Hemigrammus or Hyphessobrycon Tetra, pencil fish, small cichlids (Apistogramma for example) or Corydoras and Loricariidae. 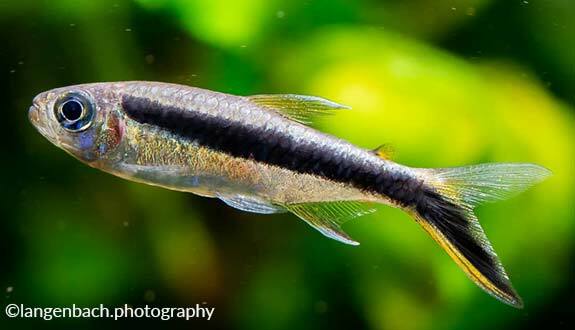 In a more general community aquarium, it will be able to live with Barbus, small Rasboras or dwarf cichlids of Africa (Pelvicachromis for example). How to breed the Penguin fish? Breeding is fairly easy overall even if a specific breeding tank is preferable to keep as many fry as possible. 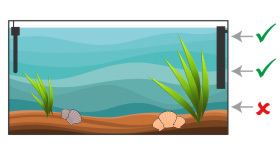 Place in a spawning tank (20 L or 4 Imp Gal or 5 US Gal) equipped with a protective bgrid and Java moss, 1 male and 3 females. New water. Temperature 26°C or 79°F and pH 7/7.5 (note that a temperature slightly higher than the maintenance tank will encourage the group to spawn). Feed individuals with live prey and spawning should not be a problem. A laying may include up to 1000 eggs. After spawning, remove the parents and renew the water without changing its parameters. Cover the aquarium to sift the lighting because the eggs are photosensitive. The incubation lasts 12 hours. Feeding fry: infusoria, nauplies of artemia and cyclops. Which aquarium for the Penguin fish? You can build your aquarium with dark substrate, lush vegetation, peat bog roots and floating plants (it likes soft light). Ideally, make your tank around an Amazonian biotope. To do this, simply use a river sand substrate, driftwood roots or turtle woods, dried oak or beech leaves (which will slightly colour the water). You can also filter on peat to simulate black water loaded with tannins specific to this biotope. In this type of installation, the lighting will be quite weak, or sifted by floating plants. Your choices of plants will have to take into account this low light (Anubias, Java moss, Cryptocorynes...). The penguin fish is a little tricky. Indeed, it is sensitive to nitrates: make changes of water regularly to keep a perfectly clean water. It takes its name “Penguin” because of its position at rest: it is inclined at about 45°.